Jahana Hayes greeting a rival, Manny Sanchez. 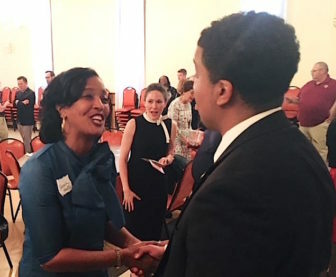 Waterbury — With just 12 days until Democrats endorse a successor to U.S. Rep. Elizabeth Esty, D-5th District, the field is suddenly coming into focus as a political newcomer with significant backing, Jahana Hayes, entered the race Wednesday, with a two-time gubernatorial nominee, William E. Curry Jr., expected to follow on Friday. On Wednesday night they mingled, uneasily at times, at the Waterbury Portuguese Sport Club with the rest of the field: former First Selectman Mary Glassman of Simsbury, New Britain Alderman Manny Sanchez, Rabbi Shaul Praver, and Richard S. Order of Simsbury, a lawyer at Updike, Kelly & Spellacy who is considering a run. It was a coming-out party for Hayes, a charismatic Waterbury teacher who was honored at the White House by Barack and Michelle Obama after being named national teacher of the year in 2016, then did a star turn on television with Ellen Degeneres, talking about how she resumed her education and eventually established a teaching career after becoming a teenaged mother in high school. She opened her campaign Wednesday with the full-throated backing of Waterbury Mayor Neil M. O’Leary and the tacit support of U.S. Sen. Chris Murphy, a Democrat who held the 5th District seat before his election to the Senate in 2012. Hayes said Murphy encouraged her candidacy, and one of his former staffers, Meghan Forgione, staffed Hayes’ first campaign appearance. 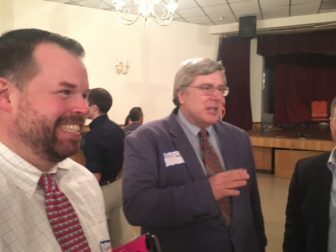 Forgione, who is married to another Murphy aide, state Rep. Sean Scanlon, D-Guilford, was Esty’s campaign finance director until the congresswoman abruptly dropped out of the race a month ago, a consequence of her mishandling of a sexual and physical harassment complaint against her former chief of staff. Ken Curran, another Murphy staffer, is the Democratic town chairman of Waterbury. Hayes said she decided to run after a return to school after the April break from a house-building trip with students for Habitat for Humanity. Glassman, who has hired two veteran political operatives, Roy Occhiogrosso and Mark Bergman, to help run her campaign, said she has raised $75,000 in her first month as a candidate. In addition to her time running Simsbury, Glassman also was the Democratic nominee for lieutenant governor in 2006 and was Ned Lamont’s running mate during his gubernatorial campaign in 2010. She conceded that Hayes was the candidate of the moment. “I’m not the shiny new toy,” Glassman said. Neither is Curry, who was a state senator from 1978 to 1982, when he ran for an open congressional seat in the old 6th District. He was elected state comptroller in 1990, then lost gubernatorial campaigns to Republican John G. Rowland in 1994 and 2002. He worked in the Clinton White House, but emerged as a critic of the party under Clinton and Obama as losing touch with the middle-class in places like the industrial Midwest and the smallish fading cities of the 5th, like New Britain, Meriden and Waterbury. William Curry, right, and Ken Curran. Curry backed Bernie Sanders over Hillary Clinton in the 2016 primary season as the Democrat who spoke to a shrinking middle class, while supporting Clinton over President Trump in the general election. He said he will announce a final decision Friday, but he expects to run. On Wednesday night, Curry was dissatisfied with the meet-and-greet, where no candidate addressed the crowd. Instead, wearing adhesive name tags, they restlessly moved around the sport club, shaking hands and making introductions.